This Neo-Classical Cabinet will relate to Western Design in two ways: 1. The cabinet will finish in the same color palette as western turquoise jewelry . The color Palette will be Silver, Black and Turquoise. 2. The cabinet will have the masculine strength of the Moorish Culture. Inserted into the upper center of the cabinets back will be a hand forged window grill circa 1400. It is my belief the Moors were the first to create the elements we now relate in Western Design. 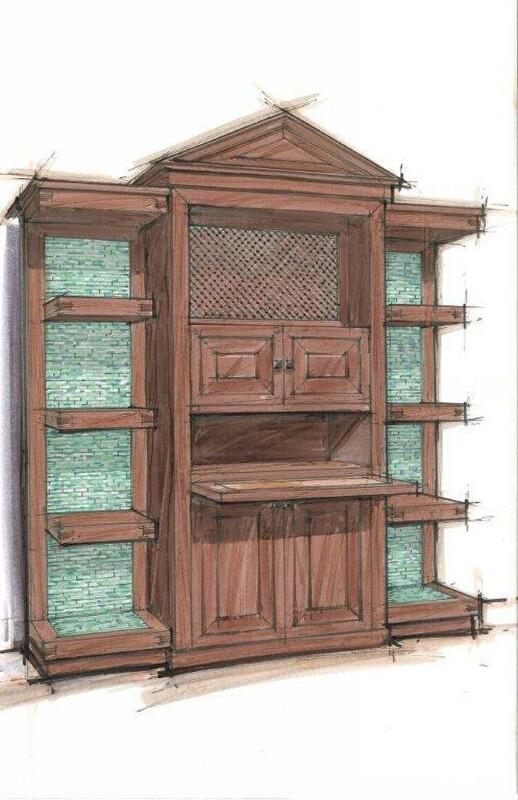 The cabinet will feature real turquoise mosaic tile by Gemstone Tile LLC. of Kingman Arizona.